If you like homemade banana bread, you're going to like this cereal... at least at first. The banana flavor is authentic and it dominates every bite. This isn't just Cheerios infused with banana flavor... it's a new banana cereal shaped like Cheerios. As a visiting friend said when I offered her some Banana Nut Cheerios, "I'm not a fan of banana flavoring, but I like this." This new variety of Cheerios doesn't taste at all like original Cheerios. The toasted oat simplicity of the original is gone. The first ingredient on the list is whole grain corn and, if you focus on the flavors beyond the overwhelming banana, you'll notice that the base of this cereal tastes more like Kix (once known as Corn Kix) or corn flakes than it tastes like Cheerios. But that's fine... it works. As to the "Nut" in Banana Nut Cheerios... there's isn't really a distinct nut flavor in the cereal. What they refer to as "Nut" is more of a toasty flavor. If you've every made a recipe that asked you to toast barley or another grain until it smells mildly nutty... that's the "Nut" here... more of a feeling than a flavor. And that's fine... because it works. The only negative thing I have to say about this cereal relates to a personal preference, but I think it's a personal preference many of us share. Banana flavor is great in mild doses, but it's one of those flavors that gets tiresome fairly quickly. So far I've had two bowls of Banana Nut Cheerios - and I've enjoyed them both very much. But I can already sense that by the end of the box I'm going to be burnt out on banana breakfast cereal. I'm going to recommend that you try this one. If you absolutely love bananas (perhaps you are bananas for bananas), you'll probably buy another box. If you're like me and dig banana flavor but don't regularly crave it, I think you'll enjoy a box of Banana Nut Cheerios as a one-time treat. What do you think of Banana Nut Cheerios? They've apparently discontinued this cereal. [*sigh ...*] It's not listed on the Cheerios site anymore and it's doubled in price where you can find it at all. This cereal is amazing. I can't stop eating it! Does not taste like Cheerios at all. I couldn't taste any banana or nut flavor. Nasty. I didn't like this cereal at all. Sorry. I recently lost 60 pounds. Part of the way I did it was to have the same easy breakfast of Cheerios with skim milk and a piece of fruit. I do it religiously and without variation. The cup makes it more convenient. I hope this doesn't sound too much like a commercial. I love fresh bananas and banana nut muffins but this cereal tastes like over ripe bananas and is way too sweet. Also it is made with a lot of corn and corn sweeteners. I prefer the multigrain Cheerios and Team Cheerios which I think are both the same thing. This cereal is terrible. I purchased it because I had a coupon and it was also on sale. Next time, I will throw the coupon away. Maybe I bought a bad batch. It tasted like a mildly burnt banana. I wouldn't even buy this cereal on sale. You can even keep your free box. Meh I love bananas but this taste isn't all that great. Id rather just put real bananas in my honey nut cheerios. Never heard of this cereal until I found two boxes while cleaning out a friend's cupboard. One had been opened, so I threw it out for the animals -- it sat there until it dissolved in the rain! I kept the other to eat, as a dry snack, and kept waiting for the banana flavor to come through. It was like the beginning of the flavor, then just sticky sweet. My tongue got "fuzzy" and the product made a rapid transit through my digestive system. I won't buy it, but I looked in the two stores where I shopped and neither one had it. I thought it must have been discontinued due to poor taste, until I found this site. People actually like it? I love cereal but this had a bizarre flavor. Almost tasted like rotten bananas. I first tried this cereal a long time ago, and I did not like it. It was way too sweet but its been almost a year since I tried it and now I LOVE it. It seems that they changed the taste within a year. I can eat this all day everyday. I am not a huge cereal fan but I absolutely love Banana Nut Cheerios. it is by fat the best cereal I have ever tasted. Very fake feeling and tasting. Not like cereal, but more like plastic-y sugar rings. Awesome!!! Please don't stop making it. I'm shocked that anyone likes this. It's too sweet, and feels somewhat artificial in the mouth. Why have Cheerios gotten so small? Years ago they used to be puffier and fresher tasting. It tasted alright. Nice to try it. Had pretty good flavor but left a bad taste in my mouth. I LOVE this cereal! I'm a huge banana fan, and the flavor is just right. I prefer this flavor by far to Honey nut Cheerios (I grow tired of Honey nut and can never finish a box). I've read above that the cereal can get soggy, but I can't say it affects me as I never ever drink milk (and I hate any kind of cereal that goes soggy, so eating it dry fixes the problem :) ). Another thing I very much like is that compared to Honey nut, the shape seems a bit smaller and thinner, and after eating some it doesn't leave my mouth sore as eating other cereal usually does. I recommend it highly, and hope I'll be able to find more! 5/5! I LOVE THIS!!! I could eat it everyday for sure :) Yum. Awesome cereal, although, it is definitely not something I want everyday. A banana lovers must have. I liked the taste of this cereal, but who wouldn't with all the added sugar. I think the flavor is excellent but I will not buy it again because the fiber amount is minimul for the amount of sugar. Yum... if the banana is too much, add another cereal to the bowl... I tried it with about 1/3 cocoa crispies... really good. I think some are disappointed because they're expecting something other than banana nut bread flavor - I think replicating the taste of this treat was the intent of this flavor. I have to say, they just about nailed it. The best banana cereal ever made, nuff said. There's no way a cereal that tastes this good is as healthy as it seems. The best banana flavored cereal I've ever tasted. If you love bananas this stuff is heaven in a box. Wow this cereal was awful. It got soggy really quickly and you can taste the artificial sweeteners... yuck. This cereal is incredible!!!! I love love love it! I'm a banana fan anyway, so this was perfect. It's my new favorite cereal. And it's pretty healthy. You can eat it with or without milk and it still taste great. I'm a huge fan of Banana Nut muffins so I had try this cereal. Asbsolutely wonderful. I think my boyfriend and best friend now love it more than I do. AMAZING! For the first time I actually bought 4 boxes of cereal at one time - Yep it's THAT good. Also, it kinda tastes like caramel popcorn (in a good way). Cheerios needs to cut out most of their flavored versions of the real thing; why not give us some true nutrition so we can make mornings something we anticipate? How many versions do we need when one outstanding one with some substance/nutrition in a bite...would be a winner for everybody? I would wish that they would avoid all inferior sugar substitutions and flavors. Why not give us some value? The first bite or two seemed pretty good. After that, there was something "odd" about the flavor that reminded me of one of the fake sweeteners and it seemed to leave a film (and odd taste) in my mouth, after I was finished eating it.. I will NOT be buying another box of this stuff..... and I'm trying to figure out what to do with the rest of the box I bought.. bleh! It is the BOMB! I am not a Cheerio fan but this is great. I want to try it with whole grain cereal and nuts ( pecan or walnuts). It curved my sweet tooth. Maybe I will loose weight. My gf bought it. It looks nothing like normal cheerios and it got soggy quite fast. The flavor was off- not nutty at all for something nut in the title. There was a strong banana taste. If you really love bananas you might like this. But for someone looking for a banana nut bread flavor look elsewhere. I think it tastes great! Hate to spoil the party but I thought it was too sticky and got really large when it got soggy. After eating 2 days in a row I got digestive problems due to the sticky and getting larger. The best banana cereal out there, it's so good, it really tastes like real bananas. You are right about the 'base' tasting like Kix. Beyond the banana, I knew I was tasting something else... that's it!! Hello I just tried banana Nut Chereos yesterday. I think they are fantastic! My new favorite cereal. It's yummy. My new favorite cereal. I think I'll try the suggestions above though, and 'cut' them with the multi grain or the regular. There should still be plenty of banana flavor, and it will make the banana nut last longer (they are more expensive than the others). For the record, though, I'm fine with the flavor of the banana nut as is. Extremely good. It wins my vote! We mixed 1 box of Banana Nut with a second box of regular or whole grain Cheerios and it's just right! I love, love, LOVE this cereal!!!! Bought 2 boxes so far and the whole family likes it alot which is rare. Awesome product! Best Cheerios yet! With almond milk and some fresh fruit, this cereal is awesome! I do agree with the fact that the banana flavoring, combined with skim milk that tastes sweet to me anyway, is kind of strong. However, I enjoyed my bowl of banana nut cheerios very much! =] I think I'll continue to buy it, but eat bowls of it in moderation. Maybe twice a week or so. Not for everyday, but great every now and again. The flavor was just like banana bread. Great taste. I love this cereal, taste great with soy milk, I take it to work in a plastic container, with soy milk and it keeps me well balanced until after lunch. Yummy! I'm a new Cheerios fan and this one is fabulous. I don't think the banana flavor is too much... I will buy this cereal again and again. I am HOOKED... Love this new cereal. This is the BEST cereal!!! 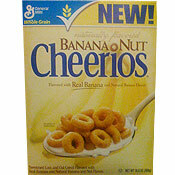 Where do you purchase this product of Banana Nut Cheerios as I have looked everywhere I know of. Doesn't taste anything like bananas. I cannot believe people like it. OMG this is the best cereal I have EVER TASTED! Where on earth can a person find this product as I enjoyed it when I got it at Sams, but they no longer sell it anymore... Banana Nut Cheerios. OH my dear lord! This is one of my new favorite cereals. It's a good banana flavor and it's good for you. I can't get enough of this excellent cereal. I really enjoy this product as I add banana to my Cheerios, anyway. My suggestion to those who think the banana flavoring is too much, just get a box of plain Cheerios and mix it in a container with some of the Banana Nut Cheerios that way you have more of a flavor balance. We are addicted! Great job! I am addicted to it as I love banana flavor. I'm happy they made this without the dehydrated fruit you find in all those other cereals which I hate. This is my new favorite cereal. I've always loved Honey Nut Cheerios - and this is like you took real bananas and some how infused it into the already perfect taste! Love them!! From the very first taste of this new Cheerios flavor I was hooked. I will not easily go back to regular Cheerios. My wife loves it just as much as I do and we have a boarder that stays with us and she loves them too. The only problem is we bought the first (2) twin pack boxes at Sam's and they have not had them for a couple of months. I have gone to various other food markets and they either have not heard of this Cheerios or they don't carry it. Please, please put those Cheerios in every store. How can you get record sales if they are not available? I will be your spokesman. 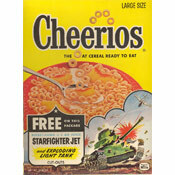 By the way I am 54 years old and I have always been a fan of Cheerios.